It’s anyone’s guess what tomorrow’s ORs will look like. Here, these authors build from their imaginations. Vitreoretinal surgery has changed significantly over the past few decades as innovations have followed the trend of smaller, faster, and safer. Stepping into the OR with current vitrectomy platforms, we have a choice of 23-, 25-, or 27-gauge instrumentation with duty cycle control and cut rates of up to 15,000 cpm. Throw in valved trocars, IOP control, and a plethora of supplemental instruments, and we feel like we have the equivalent of a Bugatti Chiron on the road. Although vitreoretinal surgery is safer and faster than ever, many of us can’t help but wonder how it might be improved even further. The advent of 3D digital visualization for surgery has opened a new horizon, offering an opportunity to make not merely incremental improvements, but paradigm shifts in the way we operate. 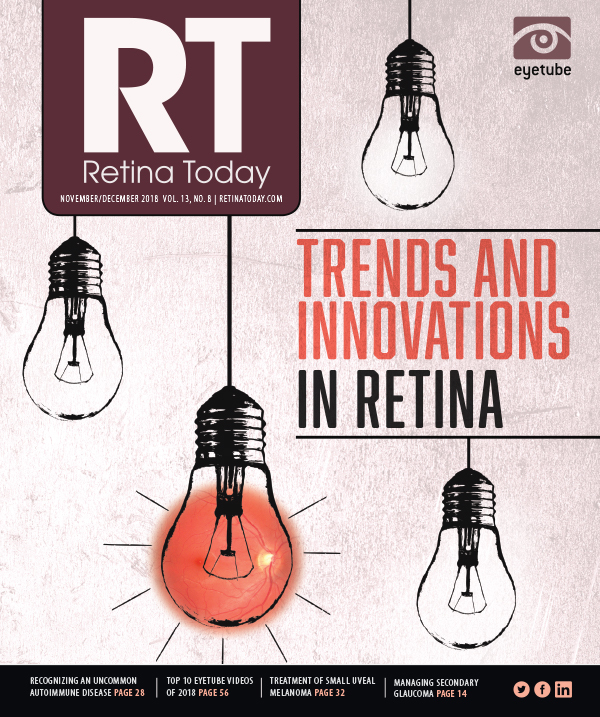 For the purposes of this article, we step into our time machine and look to the future of vitreoretinal surgery. To quote Bill, the time traveling expert from Bill and Ted’s Excellent Adventures, “Ted, you and I have witnessed many things, but nothing as bodacious as what just happened. Besides, we told ourselves to listen to this guy.” As we talk about the future of vitreoretinal surgery, we hope to be “those guys” in 10 or 15 years. The standard current digital setup for retina surgery uses fragmented technology. The operating microscope, vitreoretinal surgery platform, electronic health record system, anesthesia setup, lighting, surgical bed—everything in the OR is isolated and without interconnectivity. Yet in our daily lives, our homes, cars, and even our personal selves are more connected, thanks to the so-called internet of things, or IOT. The OR of the future will embrace connectivity. Imagine integrating patient anesthesia data and vital signs and nursing documentation into a unified, connected, patient data stream and file. The vitreoretinal OR of the future will adopt a cockpit-like setting for the surgeon. The patient stretcher will lock into place, providing ideal patient positioning and alignment. Stabilization devices will maintain precise positioning, opening the potential for robotic assistance and manipulation of instruments. Robotics will allow the most precise movements, virtually eliminating potential tremors and errant movements. In addition, autopilot functions with surgeon oversight will be able to perform guided trocar insertion, core vitrectomy, and surgical closure. If the da Vinci Surgical System (Intuitive Surgical) used in other surgical fields is any guide, we may not physically handle the surgical instruments of the future. In the surgical cockpit, multiple 3D digital screens will project live surgery views from multiple angles (discussed further below), plus supplemental information including surgical guidance, ancillary testing overlay, and surgical metrics and data. The Ngenuity 3D Visualization System (Alcon) provides magnification, visualization, and depth of field that surpass the capabilities of standard operating microscopes, but better views are coming. The current system displays 4K high dynamic range video on a 55-inch 4K 3D television. But right now 8K TVs are already commercially available for home theaters and other uses. Further, HDMI 2.1 allows up to 10K video to be transmitted at 48 Gbps. Several camera companies have developed or are developing 8K sensors in their products. To provide some perspective, 8K quadruples the number of pixels used in 4K. Pixel resolution increases from 3840 x 2160 to an astounding 7680 x 4320 pixels. For reference, 1080 pixel resolution, the current standard full high definition (HD) is 1920 x 1080 pixels. If that isn’t enough for you, 16K technology is already in development. In the surgical cockpit, the sky is the limit for data and information. Imagine a live surgery view with fluorescein angiography and OCT overlays, as needed, another screen with live intraoperative OCT imaging, and a third with endoscopic visualization. Footpedal control would allow the surgeon to seamlessly toggle among the different imaging modes and platforms, and picture-in-picture views would provide unbridled access to all available information. Artificial intelligence (AI) and machine learning have infiltrated the fields of medicine—including ophthalmology—and are poised to change the way medicine is practiced. In fact, we could argue that ophthalmology is leading the charge in AI. The US FDA recently approved the AI diagnostic device IDx-DR (IDx Technologies), which can interpret fundus images to determine the presence of diabetic retinopathy without input from a doctor. Additionally, Verily Life Sciences and Nikon, including its subsidiary Optos, are developing AI/machine learning algorithms to analyze ultra-widefield images and detect diabetic retinopathy, macular degeneration, and glaucoma. How can we employ this technology in the vitreoretinal OR of the future? Consider this scenario: You are performing core vitrectomy for a macular hole. You engage the posterior hyaloid to create a posterior vitreous detachment. As you are focused on the posterior pole and scanning the periphery for traction or tears, special software alerts you to a tear at 6 o’clock. Sure enough, a tear developed at that exact location. You continue operating and start peeling the internal limiting membrane (ILM). The software then reports that the macular hole is greater than 400 µm and that you should peel the ILM a minimum of 2 disk diameters from the hole or consider an ILM flap, and consider using C3F8 because the most recent metanalysis of macular holes showed that hole closure and visual outcomes were highest when these surgical techniques were used. You can imagine translating these same ideas to other surgical retina diseases and how the technology has the potential to improve both safety and outcomes. The possibilities of augmented reality (AR) and surgical guidance parallel those of AI and machine learning algorithms. AR is the overlay of computer-generated images on a real-world view. Retina surgeons are familiar with this technology, as we already use surgical OCT, with real-time OCT overlay in the surgical microscope. Moving into the future, software will be available for surgeons to mark retinal abnormalities such as retinal breaks and holes in real time. With digital markers, the surgeon will be able to easily track and find marked breaks throughout the case, even under air. Diathermy may no longer be necessary to mark breaks. Although advances in contact and noncontact viewing systems have steadily improved our ability to discern fine details in the posterior segment, the microscope’s output is limited to the surgeon’s two small oculars. This presents challenges when we try to incorporate any new surgical viewing technology, such as endoscopy or intraoperative OCT. Recent advances in endoscopy have provided wider fields of view and smaller curved endoscopes. However, perhaps the biggest current limitation of ophthalmic endoscopy is the small video display and generally low image quality. By connecting a small adapter to the Ngenuity system, we can move the endoscopic view from the small screen on a side cart directly onto the main surgical display. This option allows us to enlarge the endoscope image and display it to the entire surgical team while maintaining our typical live surgical view through the microscope camera. Similarly, 3D display of intraoperative OCT provides enhanced image manipulation and visualization to the entire surgical team. The Rescan 700 (Carl Zeiss Meditec) displays the OCT image in a single ocular only at the surgeon’s position, which can be visually distracting during the manipulation of tissues. When the image is shifted to the large 3D surgical screen, the OCT image is larger, easier for the surgeon to view, and available for the entire surgical team to see. In the future, we expect further improvements in the video output of endoscopes and higher quality intraoperative OCT systems, such as swept-source OCT, all of which can be easily integrated into the 3D display. Although many of the techniques and technologies mentioned above exist, it will be up to retina surgeons to work with companies to merge them into unified platforms. We hope that surgeons around the world will look into the oculars of their microscopes and imagine how much better vitreoretinal surgery could be. Finally, we urge all of our fellow surgeons to engage in this paradigm shift as we shape the future of vitreoretinal surgery. 1. Urban G, Tripathi P, Alkayali T, et al. Deep learning localizes and identifies polyps in real time with 96% accuracy in screening colonoscopy. Gastroenterology. 2018;155(4):1069-1078.